On Feb 12, 2015, the Court of Appeals denied our Petition for Rehearing. On Mar 5, 2015, we filed a Petition for Writ of Certiorari with the Colorado Supreme Court. I have attached it below. As you know, Judge Patrick’s ruling of Sept 5, 2013, was overturned by the Colorado Court of Appeals (COA) on Oct 16, 2014. CLUC believes the ruling was severely flawed on a number of fronts, and we have filed a Petition for Rehearing with the COA. If they deny our Petition, we will Petition the Colorado Supreme Court to review the case. Below, I have attached our Petition for Rehearing, as well as the COA ruling and the briefs that were filed with the COA. Please note that Gov. Hickenlooper and the State Farm Bureau both filed Amicus Briefs in support of the County and the Hostetlers. 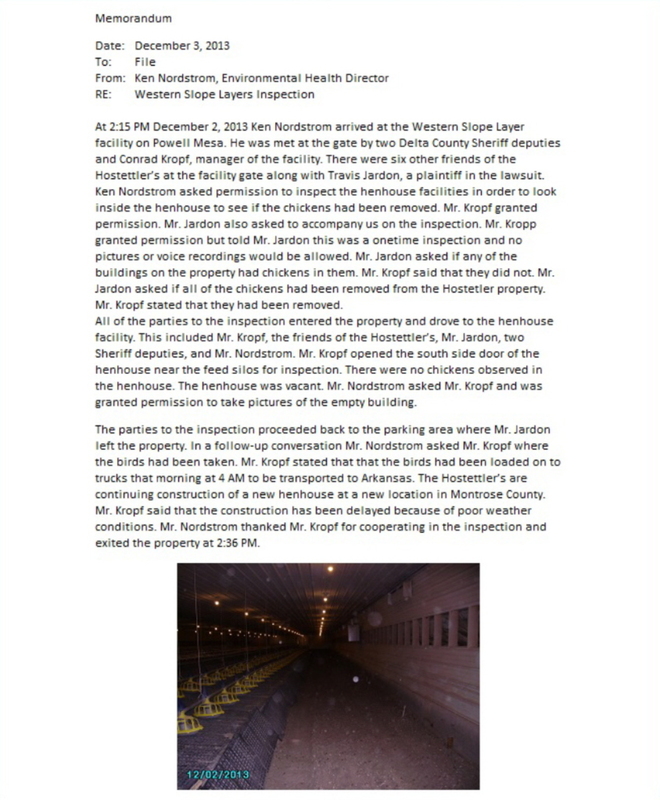 Visit the site below to view all of the videos taken of the Hostetler chicken facility discharging its toxic pollutants into the atmosphere where they are then blown onto the surrounding neighbors. Please….have your inhaler handy. Update: The Defendants’-Appellants’ Opening Brief was initially due to the Court of Appeals on Jan 21, 2014. However, they sought a 28 day extension and the Court of Appeals granted it. Their Opening Brief is now due on Feb 18, 2014. We will then have 35 days to file our Response Brief with the Court. Stay tuned…..
Dec 10, 2013…All actions hereafter are taking place in the Colorado Court of Appeals. Click the two links below to view the 60 Minutes Documentary on the ‘real’ Farm Bureau agenda. Below is the Norstrom Memo of Dec 2, 2013, written the day the Powell Mesa facility was depopulated. 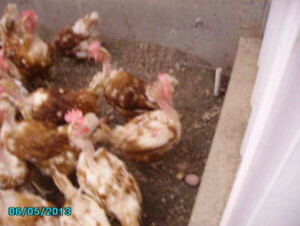 The photos were taken 10 hours after the hens were removed. Please notice that the manure inside the grated containment area is at least a foot deep, while there is virtually no manure on the dirt floor between the grated area and the wall. There is no manure there because it quickly dried, was pulverized into dust (small particulates) by the cage-free hens and discharged from the facility to be blown onto all of the downwind neighbors. This simply proves what the neighbors have been claiming all along. Click on each page for larger view. Below is the compliance letter submitted by the Hostetler attorneys. Nov 29, 2013 We received the following letter from the Hostetler attorneys seeking an agreement that would allow Hostetler to continue to operate beyond the County Cease and Desist deadline as he searches for entities willing to take the chickens. We want no part of this agreement because the health of the neighbors is what’s at stake, not some monetary arrangement to allow their continued operation. Nov 18, 2013: Judge Patrick’s Order is below. He is going to give the County the opportunity to enforce its Cease and Desist Order by Dec 1. We have serious doubts that Hostetlers will comply, so then we’ll see how the County will sanction them. A $100/day fine will have no impact on an operation raking in over $1000/day. On the other hand, a $5000/day fine would demonstrate a willingness to enforce. Nov 17, 2013: Unfortunately, on Nov 12th, we had to file a Motion for Supplemental Orders from Judge Patrick, asking him to shut the Hostetler facility down now, because the Hostetlers have not yet ceased operation of their facility after the Court of Appeals lifted the Stay. The County has given the Hostetler until Dec 1, 2013, to shut down, or they would be “sanctioned,” whatever that means. This date was unacceptable to the neighbors on Powell Mesa. All attorneys had a teleconference with Judge Patrick on Nov 15th, and he said he will issue a ruling on Nov 18th. Friends and Supporters: We, the Plaintiffs – Appellees, are extremely pleased with the Nov 1, 2013, Court of Appeals’ ruling denying the Hostetler Motion for Stay Pending Appeal. We were not surprised by this outcome, but even more pleasing was how quickly the Court ruled. The court issued its ruling less than 48 hours after receiving the Delta County Response to the Hostetler Motion for Stay, which we believe is a very positive barometer of our position in this appeal. The BoCC continues to try to make this case into something it is not. They are promoting the notion that all ag in the county is now at risk, and that the Courts have overstepped their bounds with their rulings. This is simply not true and clearly demonstrates that the BoCC does not understand what this case is about. This case has always been about the BoCC’s failure to follow the County’s land use regulations. We have argued that their actions in approving the Hostetler applications were clearly arbitrary and capricious resulting in illegal land use permits, and the Court has agreed with us. Once again, we thank all of our supporters as we move forward in this endeavor. BREAKING NEWS Nov 1, 2013….Colorado Court of Appeals DENIES Hostetler’s Motion for Stay Pending Appeal. The Cease and Desist must now be enforced. The Colorado Court of Appeals ruling came very quickly and is a thing of beauty and brevity. The neighbors will finally have clean air to breathe again!! Below is our Response to the Hostetler Motion for Stay that we filed on Oct 23, 2013. I believe Earl Rhodes wrote a masterpiece. Also below is the County Response (Holland and Hart) to the Hostetler Motion for Stay. We believe it has missed the mark. We expect the Colorado Court of Appeals to rule on the Motion for Stay by Nov 7, 2013. Check this out! Here’s the Engagement Letter between Delta County and the law firm of Holland and Hart from Denver. The County has officially brought the $500/hr lawyers on board to fight us. This document was obtained…courtesy of the Colorado Open Records Act. Oct 20, 2013 Delta County and Hostetlers have filed their appeals. Hostetlers have also filed a Motion For Stay Pending Appeal to try to keep their industrial chicken facility in operation through the 9 month appeal process. Delta County has hired the Denver law firm of Holland and Hart to handle the County’s appeal. Your tax dollars at work. Sept 26, 2013 There was a teleconference at 8:30 this morning with Judge Patrick and the attorneys for Plaintiffs, Defendant Hostetler, and Defendant County. The conference was for the Judge to hear arguments concerning the Defendants’ motions for stay of the Cease and Desist Order pending appeal. We expect a ruling soon, possible on Sept 27th. I’ll post it as soon as we have it. Sept 21, 2013, shows new mitigation efforts have NOT reduced emissions. Sept 16, 2013 Forceful smokestack tunnel ventilation system in action. THE LATEST…Both, the County and the Hostetlers, have filed motions seeking a stay of the Cease and Desist Order pending appeals that they say they will file. For a County that’s supposed to be neutral in this process, they sure are advocating on Edwin’s behalf at every opportunity. Bias?? Me thinks so. Check out this pic (supplied by Mr. Nordstrom) of a few of Edwin’s chickens just before he depopulated his facility for clean-out. It’s not a great pic, but you’ll get the idea. Kind’a funny that folks were claiming that the tiny white feathers Dr. Raymond was finding all over her property and in her house couldn’t be coming from brown chickens. Yeah, right. War zone or molt…..? UPDATE on Planning Commission. As of Sept 19, 2013, the Planning Commission has removed the item to remove all references to the Master Plan from the Specific Development Regs. It appears they’re going to wait out the results of an appeal before trying to alter the language. We’ll stay on top of it and keep you posted. We won….but….it ain’t over ’til it’s over. Two things are happening. First, the Hostetler attorney filed a Motion to Amend the Judgment. He doesn’t believe the Cease and Desist Order is valid and he says that the Judge does not have the authority to order the County to issue it; i.e, the Judge has no enforcement authority. Huh?? We have filed our Response (we believe the Hostetler attorney has totally missed the boat with his rationale) and are hopeful the Judge will deny the motion quickly so that we can get the Powell Mesa operation shut down. Second, since the BoCC lost, they have asked (told) the Planning Commission to meet on Sept. 26, 2013, and draft a resolution removing all references to the Master Plan from the Specific Development Regulations. Doing so will eliminate the regulatory requirement of the Master Plan and remove all protections for people who will be harmed by development activities of their neighbors. It is now becoming obvious that our BoCC’s response to special interests far outweighs their concern for the safety, health, and welfare of their constituents. I have posted the five major briefs that Judge Patrick will be considering in this case. The Plaintiffs’ Reply Brief was filed August 26, 2013. That was the final brief to the Court. The Air Monitoring Studies, two other County documents, and our technical responses can be viewed in the Documents’ Section. Nov 16, 2012, Plaintiffs with CLUC filed a new Part 106 (a) (4) Lawsuit against the Delta County BoCC and the Hostetlers seeking a revocation of the Oct 22, 2012, BoCC re approval of the Hostetler chicken facilities. We assert that the BoCC’s decision was capricious and arbitrary and that the decision, once again, was made without competent evidence and with total disregard for regulatory provisions of the Master Plan. Please visit out Q&A Section to view a Powell Mesa Health Impacts Map displaying neighborhood residences experiencing adverse health issues that CLUC and numerous physicians believe are directly tied to the pollutants and contaminants being discharged from the Hostetler chicken facility. CLUC is extremely grateful to all who have supported our efforts and joined our fight to preserve our wonderful quality of life throughout the North Fork Valley. Your letters and testimony during the public hearing process, your continued words of encouragement during our lengthy legal battle, and your generous contributions to our CLUC Fund are sincerely appreciated. Please take a moment and watch these short videos below of the Powell Mesa chicken facility that is now in full operation. The importance of our battle will be clearly evident. 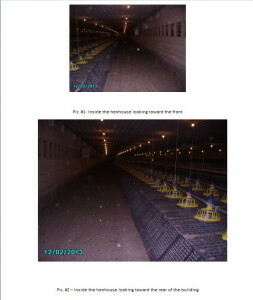 This chicken “stuff” is raining down on all of the neighbors anytime the “tunnel ventilation” system is in operation. See Q&A page for explanation of why it’s happening. Thanksgiving Day, 2012 Edwin’s gift of pollution to his neighbors. This Sept 17, 2012, video shows the dust, dander, and other pollutants being discharged from the side vents when the curtains were open. This facility is discharging constantly….one way or another. The discharge in this July 8, 2012, video is being blown directly toward the Willow Heights Subdivision and the town of Hotchkiss.